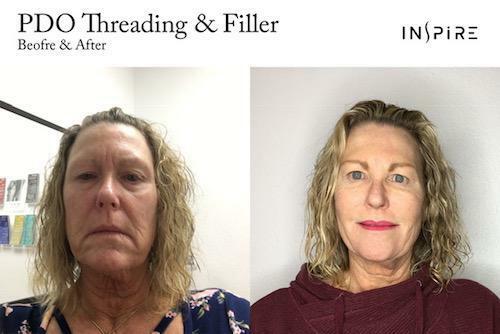 PDO threading is a way of achieving the effects of a facelift but without surgery. The procedure involves injecting dissolvable surgical threads just underneath the skin to tighten skin texture and lift it up. You see results immediately as your skin perks up and looks as if you had a facelift. The results continue to be evident as your skin accelerates collagen production in response to the threads’ presence. Collagen is a natural compound that enhances your skin’s texture and firmness. Results from threading last up to six months. Includes middle or lower facelift or neck, stronger and more advanced. Lose 10 years in 10 minutes! • Non-surgical. No scars or downtime. • Immediate results may last up to 18 months. Our patients are loving the results!